Situated in the estuary of the river deltas of the Rhine and the Maas (Meuse), Rotterdam is the seaport in Europe where by far the largest quantities of the world's mineral resources are transshipped - in 2007 about 165 million tons (crude oil approx. 97 million, iron ore approx. 40 million, coal approx. 28 million). These raw materials need to be transported to Rotterdam with the world's largest bulk carriers. At the same time, Rotterdam is also pre-eminently an offshore port. Apart from the Suezmax, Aframax, Panamax and shuttle tankers, this Volume II also includes the ore-, coal- and agribulk carriers, as well as gas- and product tankers, heavy cargo vessels and offshore construction vessels. This Volume II too will show how interesting these ships are to watch, besides their strategic and economic importance, especially when accompanied by escorting tugs or when moored underneath gigantic cranes. 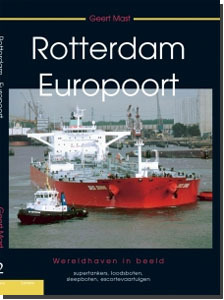 With this second volume of Rotterdam-Europoort photographer and author Geert Mast again gives us an excellent overall picture of this world port, with its many activities. A world port that never sleeps. Moreover, he shows us that everything that concerns the Port of Rotterdam is dynamic and impressive.